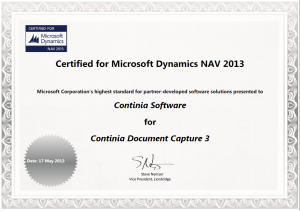 Dime is glad to inform you that Document Capture was recently Certified for Microsoft Dynamics NAV 2013. The Certified for Microsoft Dynamics (CfMD) program identifies third-party solutions that have met Microsoft’s highest standards for Dynamics implementations. Document Capture accelerates your business with automated data entry, purchase approval workflow and digital archiving of your purchase and other documents. Read more about Document Capture or watch our demo movie here or register for our next LIVE webinar on July 5th. Dime is proud to announce their partnership with Norriq Automotive Belgium for Document Capture for the Belgian incadea market. NORRIQ Belgium recently decided to offer Document Capture within the incadea®engine and the incadea®myengine solution for the automotive market. Document Capture is an innovative add-on for fully automated handling of your purchase invoices, e.g. coming from your importer or other parties from which you receive a large number of documents. It will accelerate your business with automated data entry, purchase approval workflow and digital archiving. On June 19th Dime is presenting Document Capture during NORRIQ’s customer days. Dime is pleased to announce their partnership with “Uw Dynamics Partner” in the Netherlands for the distribution of Dime.Scheduler, the graphical resource planning tool of choice for Microsoft Dynamics users and partners that are looking for a flexible and easy-to-integrate planning solution. “Uw Dynamics Partner” is located in Tilburg and provides Microsoft Dynamics NAV solutions for small and mid-sized companies. In addition to the NAV standard solutions “Uw Dynamics Partner” developed a branch specific solution for Rental and Service companies. On June 28th “Uw Dynamics Partner” will organize in collaboration with Dime a demo session for its customers to introduce Dime.Scheduler as a part of their solutions.